In July 2017, the death of two siblings aged 4 and 6 in Sarawak in northwest Borneo (Malaysia) led the national authorities to declare a rabies outbreak in the region. This event corresponded to the first reported human rabies-related deaths in Malaysia in 20 years. The incident sent a shockwave through the nation, which has a long history of implementing rabies control programmes with positive results. Malaysian authorities reacted quickly, in particular through the implementation of dog vaccination campaigns in the affected region. Dog vaccination is an essential component of rabies response programs both to control rabies in dogs, but also to halt the transmission of the disease to humans (control at the animal source). In search of a tool that could help the country act rapidly, Malaysia contacted the OIE on 20 July 2017 to assess the possibility of purchasing high-quality rabies vaccines, indicating that they currently had less than 2,000 doses at their disposal. Ten days later, Malaysia issued an official request to the OIE for 50,000 doses of rabies vaccines through the Delegate of Malaysia to the OIE. launching the delivery of rabies vaccines through the OIE Rabies Vaccine Bank mechanism. Purchase of vaccines and transportation costs paid directly to the vaccine supplier by the OIE Member Country that has been granted access to the OIE Vaccine Bank by the OIE Director General, modality known as Direct Purchase. Regardless of the modality used, all requests to access to the OIE Rabies Vaccine Bank must be developed in collaboration with the national Veterinary Services of the beneficiary country. Prepared to move fast and exercising its responsibility towards ensuring the health of its citizens, Malaysia decided to mobilise its own resources and budget to purchase the vaccines directly through the Direct Purchase modality described above. After several exchanges to establish the delivery parameters, a batch of 50,000 doses of high quality rabies vaccines arrived safely in Malaysia on the 21 August 2017, exactly one month after the official contact was made. Through the maintenance of appropriate cold chain and in accordance with the national contingency plan, the vaccination of dogs could be resumed. The capacity of the vaccine manufacturer, able to deliver the vaccines immediately, thanks to the existence of a rolling stock and its prioritization of such urgent cases. 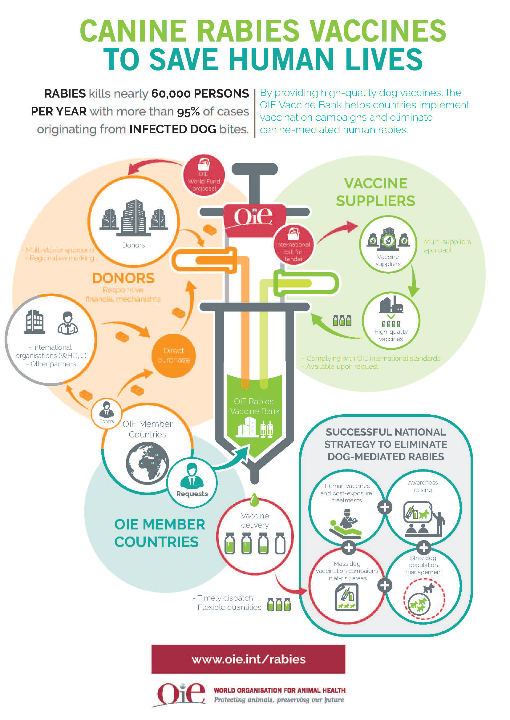 While responding to urgencies is not the primary use of the OIE Rabies Vaccine Bank, under certain conditions the OIE can positively respond to an emergency outbreak by using this tool. As per all requests, emergency or not, the National Delegate to the OIE can trigger action by issuing an official letter to the Director General of the OIE. In these cases, the OIE will endeavour to ensure an efficient response, liaising with the vaccine manufacturer to make sure that the delivery is prioritised. As of September 2018, Malaysia is still fighting the outbreak, which has already taken twelve lives over a one-year period. To continue its battle against this deadly disease, in 2018, Malaysia purchased an additional 100,000 doses through the OIE Rabies Vaccine Bank mechanism.